"The Pens" redirects here. For other uses, see Pens (disambiguation). The Pittsburgh Penguins (colloquially known as the Pens) are a professional ice hockey team based in Pittsburgh, Pennsylvania. They are members of the Metropolitan Division of the Eastern Conference of the National Hockey League (NHL). The Penguins are one of two NHL franchises in Pennsylvania, the other being the Philadelphia Flyers. The cities' proximity has led to a rivalry known as the "Battle of Pennsylvania". The club is owned by Mario Lemieux and Ronald Burkle, who purchased the Penguins in 1999 and brought the club out of bankruptcy. The franchise was founded in 1967 as one of the first expansion teams during the league's original expansion from six to twelve teams. The Penguins played in the Civic Arena, also known as The Igloo, from the time of their inception through the end of the 2009–10 season, when they moved to the Consol Energy Center, which was later renamed PPG Paints Arena. The 1992–93 Penguins won the franchise's first-ever Presidents' Trophy for being the team with the most points at the end of the regular season. In addition to their eight division titles, they have qualified for six Stanley Cup Finals, winning the Stanley Cup five times – in 1991, 1992, 2009, 2016, and 2017. Along with the Edmonton Oilers, the Penguins are tied for the most Stanley Cup championships among non-Original Six teams and sixth overall. With their Stanley Cup wins in 2016 and 2017, the Penguins became the first back-to-back champions in 19 years (since the 1997–98 Detroit Red Wings) and the first team to do so since the introduction of the NHL salary cap. They also became the fifth team to accomplish this feat multiple times. Before the Penguins, Pittsburgh had been the home of the NHL's Pirates from 1925 to 1930 and of the American Hockey League Hornets franchise from 1936 to 1967 (with a short break from 1956 to 1961). In the spring of 1965, Jack McGregor, a state senator from Kittanning, began lobbying campaign contributors and community leaders to bring an NHL franchise back to Pittsburgh. The group focused on leveraging the NHL as an urban renewal tool for Pittsburgh. The senator formed a group of local investors that included H. J. Heinz Company heir H. J. Heinz III, Pittsburgh Steelers owner Art Rooney, and the Mellon family's Richard Mellon Scaife. The projected league expansion depended on securing votes from the then-current NHL owners; to ensure that Pittsburgh would be selected as one of the expansion cities, McGregor enlisted Rooney to petition votes from James D. Norris, owner of the Chicago Black Hawks, and his brother Bruce Norris, owner of the Detroit Red Wings. The effort was successful, and on February 8, 1966, the National Hockey League awarded an expansion team to Pittsburgh for the 1967–68 season. The Penguins paid $2.5 million ($19.5 million today) for their entry and $750,000 ($5.6 million today) more for start-up costs. The Civic Arena's capacity was then boosted from 10,732 to 12,500 to meet the NHL requirements for expansion. The Pens also paid an indemnification bill to settle with the Detroit Red Wings, which owned the Pittsburgh Hornets franchise. The investor group named McGregor president and chief executive officer, and he represented Pittsburgh on the NHL's Board of Governors. The Civic Arena's capacity was increased in order to meet NHL requirements for a franchise. The arena served as the Penguins' home arena from 1967 to 2010. A contest was held where 700 of 26,000 entries picked "Penguins" as the nickname for the team. Mark Peters had the winning entry (which was inspired by the fact that the team was to play in the "Igloo", the nickname of the Pittsburgh Civic Arena), a logo was chosen that had a penguin in front of a triangle, which symbolized the "Golden Triangle" of downtown Pittsburgh." The Penguins' first general manager, Jack Riley, opened the first pre-season camp for the franchise in Brantford, Ontario, on September 13, 1967, playing the franchise's first exhibition match in Brantford against the Philadelphia Flyers on September 23, 1967. The Pens, along with the rest of the expansion teams, were hampered by restrictive rules which kept most major talent with the existing "Original Six" teams. Beyond aging sniper Andy Bathgate, All-Star defenseman Leo Boivin (who had begun his professional career with the Hornets) and Ranger veteran Earl Ingarfield, the first Penguins team was largely manned by a cast of former minor leaguers. A number of the players had played for the Hornets the previous season: Bathgate, wingers Val Fonteyne and Ab McDonald, and goaltenders Hank Bassen and Joe Daley. George Sullivan was named the head coach for the club's first two seasons, and McDonald was named the team's first captain. On October 11, 1967, league president Clarence Campbell and McGregor jointly dropped the ceremonial first puck of the Penguins' opening home game against the Montreal Canadiens. On October 21, 1967, they became the first team from the expansion class to defeat an Original Six team, as they defeated the Chicago Black Hawks 4–2. However, the Penguins went 27–34–13 and finished in fifth place in the West Division, missing the playoffs and ending with the third worst record in the league. The team's best player proved to be longtime Cleveland Barons AHL goaltender Les Binkley, who recorded a 2.88 goals against average and was second in the league in shutouts with six. Defensive winger Ken Schinkel won the team's sole league honor, being named to represent the Penguins in the NHL All-Star Game. Bathgate led the team in scoring with 59 points, but retired at season's end. McDonald, who led the team in goals and was second in team scoring, was also gone at season's end, traded to the St. Louis Blues in exchange for center Lou Angotti. The next season, 1968–69, saw the team slip in the standings in the midst of a sharp drop in form by Binkley, into sixth place and with the league's worst record. Several changes were made to try to improve the team, resulting in Boivin and several others being traded, and new players—including longtime future Pens star Jean Pronovost—making their debuts. No captain was named to replace McDonald, and the team went with four alternate captains. Schinkel was again the team's lone All-Star. Michel Briere's number was taken out of circulation after his career-ending accident in 1970. It was later formally retired in 2001. In the 1969 draft the Penguins selected Michel Briere who although being chosen 26th soon was drawing comparisons to Phil Esposito and Bobby Clarke. Joining the team in November, he finished as the second place rookie scorer in the NHL (behind Bobby Clarke) with 44 points (57th overall), and third on the Penguins. Briere placed second in Calder Memorial Trophy voting for Rookie of the Year honors to Chicago goaltender Tony Esposito in leading Pittsburgh to its first NHL playoff berth since the 1928 Pirates. The Penguins defeated the Oakland Seals in a four-game sweep in the quarter-finals, with Briere scoring the series-clinching goal in overtime. In the semi-final round, defending conference champions St. Louis Blues got the best of the Penguins during six games. Briere led the team in playoff scoring, recording five goals (including three game winners) and eight points. Tragedy struck the Penguins just days after their playoff heroics. On May 15, 1970, Briere was in a car crash in his native Quebec, suffering brain trauma and entering a coma from which he would never recover, dying a year later. His number 21 jersey was never reissued, remaining out of circulation for the Penguins until it was formally retired in 2001. The next season the Penguins finished five games out of the playoffs with a 21–37–20 record, the fourth worst record in the league. Pittsburgh achieved a playoff berth in 1972 only to be swept by the Chicago Black Hawks in the first round. With the exception of a handful of decent players such as Ken Schinkel, Jean Pronovost, Syl Apps Jr., Keith McCreary, agitator Bryan Watson and goaltender Les Binkley, talent was otherwise thin, but enough for the Penguins to reach the playoffs in both 1970 and 1972. The Penguins battled the California Golden Seals for the division cellar in 1974, when Riley was fired as general manager and replaced with Jack Button. Button traded for Steve Durbano, Ab DeMarco, Bob "Battleship" Kelly and Bob Paradise. The personnel moves proved successful, as the team improved to a 28–41–9 record, although they remained nine points away from a playoff berth. However, in early 1975, the Penguins' creditors demanded payment of back debts, forcing the team into bankruptcy. The doors to the team's offices were padlocked, and it looked like the Penguins might fold or relocate. Around the same time, rumors had begun to circulate that the Penguins and California Golden Seals were to be relocated to Seattle and Denver respectively, the two cities that were to have been the sites of an expansion for the 1976–77 season. Through the intervention of a group that included former Minnesota North Stars head coach Wren Blair, the team was prevented from folding and remained in Pittsburgh, eventually being bought by shopping mall magnate Edward J. DeBartolo, Sr.
During the mid-1970s, Lowell MacDonald was a paired with Syl Apps Jr. and Jean Pronovost forming the Century Line. MacDonald played with the Penguins from 1970 to 1978. Beginning in the mid-1970s, Pittsburgh iced some powerful offensive clubs, led by the likes of the "Century Line" of Syl Apps, Lowell MacDonald and Jean Pronovost. They nearly reached the Stanley Cup semi-finals in 1975, but were ousted from the playoffs by the New York Islanders in one of the only four best-of-seven game series in NHL history where a team came back from being down three games to none. As the 1970s wore on, the Penguins brought in other offensive weapons such as Rick Kehoe, Pierre Larouche and Ron Schock, along with solid blue-liners Ron Stackhouse and Dave Burrows. But the Pens' success beyond the regular season was always neutralized by mediocre team defense. Goaltender Denis Herron was a stalwart in goal for parts of six seasons. Baz Bastien, a former coach and general manager of the AHL's Hornets, later became general manager. The Penguins missed the playoffs in 1977–78 when their offense lagged, and Larouche was traded for Peter Mahovlich and Peter Lee. Bastien traded prime draft choices for several players whose best years were already behind them, such as Orest Kindrachuk, Tom Bladon and Rick MacLeish, and the team would suffer in the early 1980s as a result. The decade closed with a playoff appearance in 1979 and a rousing opening series win over the Buffalo Sabres before a second-round sweep at the hands of the Boston Bruins. The Penguins began the 1980s by changing their team colors; in January 1980, the team switched from wearing blue and white to their present-day scheme of black and gold to honor Pittsburgh's other sports teams, the Pirates and the Steelers, as well as the Flag of Pittsburgh. Both the Pirates and Steelers had worn black and gold for decades, and both were fresh off world championship seasons at that time. The Bruins protested this color change, claiming a monopoly on black and gold, but the Penguins defended their choice by stating that the NHL Pirates also used black and gold as their team colors and that black and gold were Pittsburgh's traditional sporting colors. The NHL agreed and Pittsburgh was allowed to use black and gold. The Penguins officially debuted wearing black and gold against the St. Louis Blues at the Civic Arena on January 30, 1980. On the ice, the Penguins began the 1980s with defenseman Randy Carlyle, and prolific scorers Paul Gardner and Mike Bullard, but little else. During the early part of the decade, the Penguins made a habit of being a tough draw for higher-seeded opponents in the playoffs. In 1980, the 13th-seeded Penguins took the Bruins to the limit in their first round playoff series. The following season, as the 15th seed, they lost the decisive game of their first-round series in overtime to the heavily favored St. Louis Blues. Then, in the 1982 playoffs, the Penguins held a 3–1 lead late in the fifth and final game of their playoff series against the reigning champions, the New York Islanders. However, the Islanders rallied to force overtime and won the series on a goal by John Tonelli. It would be the Pens' final playoff appearance until 1989. Mario Lemieux played for the Penguins in three stints (1984–1994, 1995–1997, 2000–2006). The team had the league's worst record in both the 1983 and 1984 seasons, and with the team suffering financial problems, it again looked as though the Penguins would either fold or relocate. Mario Lemieux, one of the most highly touted NHL draft picks in history, was due to be drafted in the 1984 NHL Entry Draft. Heading towards the end of the season ahead of the New Jersey Devils, who were placed last, the Penguins made a number of questionable moves that appeared to weaken the team in the short-term. The Penguins posted three six-game winless streaks in the last 21 games of the season and earned the right to draft Lemieux amidst protests from Devils management. Pittsburgh head coach Lou Angotti later admitted that a conscious decision was made to finish the season as the team with the worst record, stating in an interview with the Pittsburgh Post-Gazette that a mid-season lunch prompted the plan, in light of the fact that there was a high chance of the franchise folding if Lemieux was not drafted. Other teams offered substantial trade packages for the draft choice, but the Penguins kept the pick and drafted Lemieux first overall. Lemieux paid dividends right away, scoring on his first ever shot of his first ever NHL shift, in his first NHL game. However, the team spent four more years out of the playoffs after his arrival. In the late 1980s, the Penguins finally gave Lemieux a strong supporting cast, trading for superstar defenseman Paul Coffey from the Edmonton Oilers (after the Oilers' 1987 Stanley Cup win) and bringing in young talent such as scorers Kevin Stevens, Rob Brown and John Cullen from the minors. Also, the team at last acquired a top-flight goaltender with the acquisition of Tom Barrasso from Buffalo. All this talent had an immediate impact in helping Lemieux lead the Pens; but the Penguins struggled to make the playoffs. The 1985–86 Pens unluckily missed the playoffs on the final day of the season by one game. In 1986–87, the Penguins missed the playoffs by just two games and saw four teams with equal or worse records qualify. In 1987–88, the team again missed the playoffs on the last day of the season by one game. In 1989, Pittsburgh finally broke through the barrier and made the playoffs, on the back of Lemieux leading the league in goals, assists and points. On December 31, 1988, Lemieux became the only player in history to score a goal in all five possible game situations in the same game (even strength, shorthanded, penalty shot, power play, and empty net). The Pens shocked the New York Rangers in a four-game sweep in the first round, however their run was halted by the Philadelphia Flyers in the second round. The seven game defeat featured Mario Lemieux scoring five goals in the fifth game. Bob Johnson coached the Penguins to their first Stanley Cup title in the 1991. A herniated disc in Lemieux's back cut short his 1989–90 season, although he still amassed 123 points. However, the Penguins fell out of the playoff picture. The Penguins opted to strengthen their roster and support Lemieux in the 1990 off-season. Free agent signings (Bryan Trottier) and trades (Joe Mullen, Larry Murphy, Ron Francis and Ulf Samuelsson) played a major part of this. Arguably no move was bigger during this time than when the Penguins drafted Jaromir Jagr with the fifth overall pick in the 1990 NHL Entry Draft. The first Czechoslovak player to be drafted into the NHL without first needing to defect to the West, Jagr became the Penguins' second franchise player, and quickly developed into a superstar offensive talent. The roster overhaul culminated in the Penguins winning their first Stanley Cup title by defeating the Minnesota North Stars in the Stanley Cup Finals in six games, punctuated by an 8–0 victory in the deciding game, the largest margin of victory in a final Stanley Cup game in over 80 years. After the 1991 Stanley Cup Finals, the Penguins met with President George H. W. Bush, the first NHL team to ever visit the White House. The following season, the team lost coach Bob Johnson to cancer, and Scotty Bowman took over as coach. Under Bowman, they swept the Chicago Blackhawks to repeat as Stanley Cup champions in 1991–92. Cancer revisited the Penguins in 1993 when Lemieux was diagnosed with Hodgkin's disease. Only two months after the diagnosis, missing 24 out of 84 games, he came back to win his fourth Art Ross Trophy as scoring champion with 160 points, edging out Pat LaFontaine and Adam Oates. Despite the off-ice difficulties, Pittsburgh finished with a 56–21–7 record, the franchise's best regular season ever, winning the franchise's first (and, as of 2019, only) Presidents' Trophy. After Lemieux's return, the team played better than it ever had before, winning an NHL-record 17 consecutive games. Despite all of this success, they were eliminated in the second round by the New York Islanders in overtime of Game 7. The Penguins continued to be a formidable team throughout the 1990s. The stars of the Stanley Cup years were followed by the likes of forwards Alexei Kovalev, Martin Straka, Aleksey Morozov, Robert Lang and Petr Nedved, and defensemen Sergei Zubov, Darius Kasparaitis and Kevin Hatcher. Despite the departure of many of the franchise's Stanley Cup-winning roster, the Penguins fielded enough talent to reach the first round of the playoffs in 1994 (where they lost to the Washington Capitals in six games), the second round in 1995 (where they lost to the New Jersey Devils in five games) and the conference finals in 1996 (where they lost to the Florida Panthers in seven games). The 1997 playoffs marked a turning point, as the Penguins suffered a first-round elimination at the hands of the rival Philadelphia Flyers in five games. Lemieux with the Penguins during the 2000–01 season, the last season he played before he retiring. The franchise was rocked on April 6, 1997, when Mario Lemieux, citing ongoing health concerns, and disapproval with the way NHL hockey was being officiated, announced that he would retire at the conclusion of the 1997 playoffs. Lemieux was so respected in the NHL, and his achievements over the course of his career were so great, that he was inducted into the Hockey Hall of Fame in the same year as he retired, the three-year waiting period being waived. His departure would essentially be the first in a series of events that would lead the Penguins once again into regular season stagnation, and to the brink of financial ruin. The team was eliminated in the first round of the playoffs in 1998 by the Montreal Canadiens, despite being the second-seeded team in the East. The following year, their playoff run ended in the second round when they lost to the Toronto Maple Leafs in six games. In 2000, the Penguins stunned the highly touted Washington Capitals 4–1 in the first round only to fall to the Philadelphia Flyers 4–2 in the second round. At this point, the lofty contracts handed out during the early 1990s were beginning to catch up with the franchise. Their free-spending ways culminated in the team owing in excess of $90 million to various creditors. Then-owners Howard Baldwin and Morris Belzberg (who bought the Penguins after their first Stanley Cup win) asked the players to defer their salaries to help pay the bills. When the deferred salaries finally came due, combined with other financial pressures, the Penguins were forced to file for Chapter 11 bankruptcy in November 1998. At this point, Lemieux stepped in with an unusual proposal to buy the team out of bankruptcy. The Penguins owed Lemieux $32.5 million in deferred salary, making him the team's largest individual creditor. He proposed to recover this money by converting it into equity—enough to give him controlling interest over the team. He also vowed to keep the team in Pittsburgh. The NHL and the courts agreed, and Lemieux (with help from supermarket tycoon Ronald Burkle) assumed control on September 3, 1999, thus saving the franchise for the second time. Lemieux once again shocked the hockey world by announcing at a press conference on December 8, 2000, his intentions to return to the Penguins as an active player. On December 27, 2000, Lemieux stepped onto NHL ice for the first time in 44 months, officially becoming the first player–owner in NHL history. Lemieux helped lead the Penguins deep into the 2001 playoffs, highlighted by an overtime victory against the Buffalo Sabres in Game 7 of the second round. Darius Kasparaitis scored the series-clinching goal to advance the Penguins to the Eastern Conference Finals, where they lost in five games to the New Jersey Devils. Marc-Andre Fleury was drafted first overall in 2003 by the Penguins. The Penguins' attendance had dwindled in the late 1990s. In 1998–99, the Penguins had an average attendance of 14,825 at home games, the lowest it had been since Lemieux's rookie year. Reducing revenue on top of the previous bankruptcy necessitated salary shedding. The biggest salary move was the trading of superstar Jaromir Jagr to the Washington Capitals in the summer of 2001. The return for Jagr was mediocre, at best, as the Penguins received prospects Kris Beech, Michal Sivek and Ross Lupaschuk. The Penguins missed the playoffs for the first time in 12 years in 2002, finishing in a tie for third-to-last in the conference. Further financial difficulties saw them trade Alexei Kovalev back to the New York Rangers the next season, quickly followed by the free agency departure of Robert Lang. The 2002–03 season was even worse, with the team finishing second-last in the conference. The situation began to echo the dark days of the early 1980s. However, just like in the 1980s, the Penguins used the opportunity to rebuild through the draft and acquire elite prospects. In the 2003 NHL Entry Draft, the Penguins selected goaltender Marc-Andre Fleury with the first overall pick. The 2003–04 season was an ordeal with Lemieux missing all but 24 regular season games with a hip injury, and attendance dipping to an average of 11,877 (the lowest average out of any NHL team), with just one sellout. As the season progressed, the Penguins signed new head coach (and former Penguins player and commentator) Ed Olczyk, traded Martin Straka to the Los Angeles Kings and opted not to include the highly rated Fleury in the lineup for the bulk of the 2003–04 season. This culminated in the worst record in the NHL, as they won just 23 games. As in the 1980s, the Penguins' struggles were fortuitously concurrent with a string of NHL Entry Draft classes that would yield multiple world-class talents. The Penguins lost out on the first overall pick for the 2004 NHL Entry Draft, which went to the Washington Capitals. As expected, the Capitals made Russian superstar Alexander Ovechkin the top pick. However, Ovechkin's countryman, center Evgeni Malkin, was similarly highly regarded, and Pittsburgh took him with the second overall pick. By this point, the Penguins had collapsed financially since the Stanley Cup-winning years of the early 1990s. Their home venue, the Civic Arena, had become the oldest and was widely regarded as the worst arena in the NHL, and Lemieux had tried unsuccessfully to cut a deal with the city for a new facility. With Pittsburgh uninterested in building a new hockey arena for the struggling Penguins, Lemieux began looking into the possibilities of selling and/or relocating the team to Kansas City, Missouri. The 2004–05 NHL season was canceled due to a lockout. One of the many reasons for the lockout included disagreements on the resolution of the financial struggles of teams like the Penguins and the Ottawa Senators, which had filed for bankruptcy protection. In the midst of the lockout, the Penguins dispersed between the club's American Hockey League (AHL) affiliate, the Wilkes-Barre/Scranton Penguins, and to European leagues. Sidney Crosby during his sophomore season with the Penguins. He was drafted first-overall by the team in the 2005 draft. With the lockout resolved in 2005, the NHL organized an unprecedented draft lottery to set the 2005 NHL Entry Draft selection order. The draft lottery, which was held behind closed doors in a "secure location", resulted in the Penguins being awarded the first overall pick. This was the second time in NHL history the Penguins had won the first overall pick outright, their first overall selection in the 2003 NHL Entry Draft having come as the result of a trade with the Florida Panthers. The draft that year was being touted as having the greatest rookie class since Lemieux, himself, had been drafted. Quebec Major Junior Hockey League (QMJHL) superstar Sidney Crosby (who had been training with Lemieux over the summer) was the consensus first overall pick, with many referring to the draft lottery process as "The Sidney Crosby Sweepstakes". The Penguins selected Crosby on July 30, 2005, with the top pick, instantly rekindling interest in hockey in Pittsburgh. The Penguins then began rebuilding the team under the salary cap. They signed free agents Sergei Gonchar, John LeClair and Zigmund Palffy and traded for goaltender Jocelyn Thibault. However, Evgeni Malkin, the Penguins' 2004 draft pick, second overall, could not report to Pittsburgh immediately due to a playing rights dispute with the Russian Superleague. The addition of Crosby paid instant dividends, with attendance rising by approximately 4,000 on average in the 2005–06 season. However, Crosby's presence did not immediately translate into wins, as the team began the season with a long winless skid that resulted in a head coaching change from Olczyk to Michel Therrien. Palffy announced his retirement mid-season due to a lingering shoulder injury as the team's second-leading scorer. Then, on January 24, 2006, Lemieux announced his second retirement, this time permanently, after developing an irregular heart beat. He finished as the NHL's seventh all-time scorer (1,723), eighth in goals (690) and tenth in assists (1,033), but also with the second highest career points per game average (1.88), which is second to Wayne Gretzky's 1.92. Despite the team's various struggles, Crosby lived up to the hype and became an instant superstar amassing 102 points in his debut season and finishing second to Washington's Alexander Ovechkin for the Calder Memorial Trophy awarded each year to the league's top rookie. In the Penguins' final game of the season, Crosby tallied a goal and an assist to become the top scoring rookie in Penguins history (eclipsing Lemieux). The Penguins once again posted the worst record in the Eastern Conference and the highest goals-against total in the League. They received the second overall draft pick, their fourth top two pick in four years, in the 2006 NHL Entry Draft and selected touted two-way forward Jordan Staal. The team announced on April 20 that the contract for general manager Craig Patrick would not be renewed. Patrick had been the general manager since December 1989. On May 25, Ray Shero signed a five-year contract as general manager. Evgeni Malkin made an immediate impact, driving the Penguins to their first playoff appearance in six years. Change came for the Penguins on October 18, 2006, when rookie Evgeni Malkin made his NHL debut. He went on to set the modern NHL record with a goal in each of his first six games. Malkin would go on to record points in 16 consecutive games with 14 wins and 2 overtime losses in early 2007. The Penguins finished the 2006–07 season in fifth place in the Eastern Conference with a record of 47–24–11, totaling 105 points, only two points behind the Atlantic Division winners, the New Jersey Devils. It was the franchise's first 100-point season in 11 years, and represented an enormous 47-point leap from the previous season. In the first round of the 2007 playoffs, the Penguins were defeated 4–1 by the eventual Stanley Cup runners-up, the Ottawa Senators. At the season's end, rookies Evgeni Malkin and Jordan Staal were finalists for the Calder Memorial Trophy, awarded to the Rookie of the Year, which Malkin won. 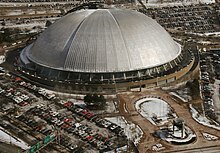 On March 13, 2007, Pennsylvania Governor Ed Rendell, Allegheny County Chief Executive Dan Onorato, Pittsburgh Mayor Luke Ravenstahl and Mario Lemieux of the Pittsburgh Penguins ownership group publicly announced that an agreement had been reached among the parties to build the long sought arena. The state-of-the-art, multi-purpose facility, the Consol Energy Center, guaranteed that the Penguins would remain in the city of Pittsburgh. Following the announcement of the plan, the Lemieux ownership group announced that they no longer had plans to sell the team. On June 8, 2007, a $325 million bond was issued and the Penguins signed a 30-year lease, binding the Penguins to the city of Pittsburgh through 2040; the lease agreement was signed on September 19. After a mediocre start to the 2007–08 season, Crosby and starting goaltender Marc-Andre Fleury were both injured long-term due to high right ankle sprains. In their absence, the Penguins flourished due to the play and leadership of center Evgeni Malkin and backup goaltender Ty Conklin. On February 26, the Penguins would acquire the Atlanta Thrashers' star right winger Marian Hossa and forward Pascal Dupuis at the NHL trade deadline, trading away Colby Armstrong, Erik Christensen, Angelo Esposito and a first-round pick in 2008. On April 2, 2008, the Penguins clinched the Atlantic Division title—their first division title in 10 years—with a 4–2 win against rivals the Philadelphia Flyers. However, they closed the season with a loss to the Flyers on the next night, relegating them to the second seed in the East behind the Montreal Canadiens. The Pens had spent most of the second half going back-and-forth with the Habs for first place in the East. Evgeni Malkin finished the season with 106 points for second place in the league, behind only Washington's Alexander Ovechkin, and also finished as a finalist for the Hart Memorial Trophy. Crosby, Bill Guerin, and Chris Kunitz during the 2009 Stanley Cup Finals. The Penguins defeated the Detroit Red Wings in the Finals, earning their third Stanley Cup title. The team launched into their first extended playoff run in many years, beating Ottawa 4–0, defeating the New York Rangers 4–1 and then defeating the Philadelphia Flyers 4–1 to clinch the Prince of Wales Trophy. Pittsburgh went on to lose the 2008 Stanley Cup Finals to the Detroit Red Wings in six games, finishing the playoffs with a 14–6 record. Crosby finished the playoffs with 27 points (6 goals and 21 assists in 20 games), tying Conn Smythe Trophy-winner Henrik Zetterberg (13 goals and 14 assists in 22 games) for the playoff scoring lead. In the 2008–09 season, Malkin won the Art Ross and was a candidate for the Hart Memorial Trophy for MVP. Crosby finished third in League scoring with 33 goals and 70 assists for 103 points, despite missing five games. The Penguins' record dipped mid-season but lifted after head coach Therrien was replaced by Dan Bylsma and defenseman Sergei Gonchar returned from injury. The effect was almost instantaneous and the Penguins recovered enough to secure home ice advantage in their first round matchup against the Philadelphia Flyers, whom the Penguins defeated in six games. The next series, against Washington, took all seven games for the Penguins to win, sending them to the Eastern Conference Finals, where they eliminated the Carolina Hurricanes in a four-game sweep. After defeating the Hurricanes, the Penguins earned their second consecutive trip to the Stanley Cup Finals against the Detroit Red Wings, to whom they had lost the previous year. After losing Games 1 and 2 in Detroit, just like the previous years, the Penguins won Games 3 and 4 in Pittsburgh. Each team won on home ice in Games 5 and 6. In Game 7 in Detroit, Maxime Talbot scored two goals, including the game-winner, as the Penguins won 2–1 to win their third Stanley Cup title. Malkin was awarded the Conn Smythe Trophy as the MVP of the playoffs. Outside of Consol Energy Center (now PPG Paints Arena) in March 2010 before it officially opened. The Penguins opened the 2009–10 season against the New York Rangers. It was the last home opener at the Mellon Arena and it was also the night the team raised the Stanley Cup championship banner to the arena's rafters. For the second-straight year, the Penguins finished the season in second place, behind New Jersey. Crosby scored 109 points (51 goals and 58 assists) in 81 games, winning the Maurice "Rocket" Richard Trophy as the NHL season's leading goalscorer. The Penguins, seeded fourth in the East, began their title defense defeating the Ottawa Senators in six games. In the next round, the Penguins faced the Montreal Canadiens. The teams would swap wins in the series en route to the decisive Game 7, which the Penguins lost 5–2, ending their season and their tenure at Mellon Arena. The Penguins hosted the Washington Capitals at Heinz Field during the 2011 NHL Winter Classic. In 2010–11, the Penguins played their first game in the Consol Energy Center, a loss to their rivals, the Philadelphia Flyers. The season was marred by a season-ending concussion and knee injury to Sidney Crosby and Evgeni Malkin, respectively. The Penguins made an early exit in the playoffs, losing the series after taking a 3–1 series lead over the Tampa Bay Lightning, with the goaltending of Marc-Andre Fleury called into question. With Sidney Crosby still sidelined with post-concussion syndrome, at the start of the 2011–12 season, Evgeni Malkin led the Penguins' top line and dominated league scoring. He finished with 50 goals and 109 points as the Penguins earned 51 wins on the season. With Malkin's Art Ross-winning performance and Crosby's late-season return from injury, the Penguins headed into the 2012 playoffs with high hopes of making a significant Stanley Cup run. However, the highly favored Penguins were defeated in six games by their cross-state rivals, the Philadelphia Flyers, after starting the series 0–3. Malkin was later awarded the Hart Memorial Trophy and Lester B. Pearson award. Following the Penguins' disappointing playoff exit, general manager Ray Shero made sweeping changes to the team at the 2012 NHL Entry Draft for the upcoming 2012–13 season. During the lockout-shortened 2012–13 season, the Penguins again fought through serious injury. Malkin missed 17 games to a mild concussion and shoulder injury, while Crosby missed the entire month of April with a broken jaw. At the trade deadline, general manager Shero sold-off several prospects and draft picks to acquire Jarome Iginla, Brendan Morrow, Douglas Murray and Jussi Jokinen in separate deals. At the end of the regular season, the Penguins finished atop the Eastern Conference, matching-up against the eighth-seeded New York Islanders in round one. The Penguins defeated the Islanders in six games, with Marc-Andre Fleury struggling once again and being replaced by Tomas Vokoun after Game 4. The Penguins then dispatched the Ottawa Senators in five games before being swept in the Conference Finals by the Boston Bruins, scoring just two goals in the entire four-game sweep. On June 13, 2013, Malkin signed an eight-year contract extension worth an annual average of $9.5 million. This extension, along with Crosby's 12-year extension previously signed in the 2012 off-season, ensured that the duo would remain the core of the Penguins for the foreseeable future. In the 2013–14 season, the Penguins again suffered through numerous injuries throughout the campaign. Despite the adversity, the Penguins won the realigned, eight-team Metropolitan Division, though Pittsburgh struggled in the playoffs, requiring six games to defeat the Columbus Blue Jackets, then losing to the New York Rangers in seven games despite leading the series 3–1 after four games. The team's series collapse prompted Penguins ownership to fire general manager Shero, replacing him on June 6 with Jim Rutherford, the former general manager of the Carolina Hurricanes. Rutherford's first action as general manager was to fire head coach Dan Bylsma, and on June 25, he announced that Mike Johnston was hired as Bylsma's replacement. On July 1, 2015, the Penguins acquired right winger Phil Kessel in a multi-player deal. In the 2014–15 season, the Penguins led the Metropolitan Division for the first half of the season. However, after losing players to injuries and illnesses, including the mumps, the team fell to fourth in the Division. As a result, the Penguins were in danger of elimination from playoff contention with one game remaining in the regular season. However, in the final game, the Penguins clinched the eighth and final playoff spot with a win against the Buffalo Sabres, which simultaneously eliminated the Boston Bruins from playoff contention after the team's loss to the Tampa Bay Lightning. Nonetheless, Pittsburgh would lose in five games to the New York Rangers in the first round of the playoffs. In the off-season, Rutherford traded a number of players and picks to acquire Phil Kessel, Nick Bonino and Matt Cullen. On December 12, 2015, the team had a record of 15–10–3. The organization then fired head coach Mike Johnston and replaced him with Mike Sullivan, head coach of the organization's AHL affiliate, the Wilkes-Barre/Scranton Penguins. This move was followed by a series of trades by Jim Rutherford. On December 14, Rob Scuderi was traded to the Chicago Blackhawks in exchange for Trevor Daley. On January 16, 2016, the Penguins traded forward David Perron and defenseman Adam Clendening to the Anaheim Ducks in exchange for Carl Hagelin. On February 27, 2016, the Penguins acquired Justin Schultz from the Edmonton Oilers in exchange for a third-round pick in 2016. To supplement these trades, the Penguins called-up several players from Wilkes-Barre/Scranton, including Conor Sheary, Tom Kuhnhackl, Bryan Rust and goaltender Matt Murray, who all would become regulars in the team's playoff lineup. Crosby with the Stanley Cup during the Penguins' victory parade. The team won their fourth Stanley Cup championship in 2016. The Penguins qualified for the playoffs for the tenth consecutive season. They earned second place in the Metropolitan Division with 104 points. In the playoffs, the Penguins defeated the Rangers in a 4–1 series, the Capitals 4–2 and the Lightning 4–3 to win the Eastern Conference Championship, advancing to the Stanley Cup Finals against the San Jose Sharks. On June 12, 2016, the Penguins defeated the Sharks in a 4–2 series to win their fourth Stanley Cup title. Captain Sidney Crosby was awarded the Conn Smythe Trophy. The Penguins opened their 50th anniversary season in the NHL as defending Stanley Cup champions, raising their commemorative banner on October 13, 2016, in a shootout victory over Washington. With the Detroit Red Wings' playoff appearance streak ending at 25 seasons, the Penguins appeared in the playoffs for the 11th consecutive season, now the longest active streak in the NHL. The Penguins faced the Columbus Blue Jackets in the opening round of the 2017 playoffs, defeating them in five games. In the second round, they played against their divisional rival, Washington, and faced them for the second-straight year in the same round where the Penguins won after a hard-fought seven game series. In the Conference Finals, the Penguins eliminated the Ottawa Senators in seven games to advance to the Stanley Cup Finals, where they faced the Nashville Predators. The Penguins won the first two games of the Finals and then lost the next two matchups before dominating the fifth and the sixth games of the series to win the Stanley Cup for the second straight year. By defending their title, the Penguins became the first team since the 1997–98 Detroit Red Wings to successfully defend their title, and the first to do so in the salary cap era. Patric Hornqvist celebrates the 2017 Stanley Cup clinching-goal against the Nashville Predators. Before the 2017–18 season, the Penguins lost longtime goaltender Marc-Andre Fleury in the 2017 NHL Expansion Draft to the Vegas Golden Knights. Nevertheless, the Penguins once again qualified for the Stanley Cup playoffs with the second division playoff spot, finishing the regular season with 100 points. They defeated the Philadelphia Flyers in the first round in six games, but were defeated by the eventual Stanley Cup champion Washington Capitals in six games. Despite Pittsburgh's long history with hockey and having a small, but loyal fanbase early on, the Penguins struggled with fan support early on in its history, at times only averaging 6,000 fans per game when Civic Arena had a seating capacity over 16,000. Fan support was so low by the team's first bankruptcy that the NHL had no problems with the team being moved, something that would change decades later when the team faced another relocation threat. While the drafting of Mario Lemieux began piquing interest in hockey locally, fan support was still skeptical. John Steigerwald, brother of former Penguins broadcaster Paul Steigerwald, once noted in his autobiography that upon his arrival at KDKA-TV from WTAE-TV in 1985 that the station cared more about the Pittsburgh Spirit of the Major Indoor Soccer League than the Penguins. However, Lemieux's play steadily grew the fanbase in the area, which would only be reassured upon the arrival of Sidney Crosby after the team struggled both on the ice and in attendance following the Jaromir Jagr trade. Today, the Penguins are one of the NHL's most popular teams, especially among American non-Original Six franchises and are considered second behind the Steelers among Pittsburgh's three major professional sports teams, taking advantage of both its success and the Pittsburgh Pirates struggles both on and off the field. Especially notable was a 2007 survey done of the four major sports leagues 122 teams, in which the Penguins surprised observers by being ranked 20th overall and third among NHL teams, while the Steelers were ranked number one and the Pirates (before the arrival of Andrew McCutchen and that team's turnaround) ranking much lower on the list from its peers. The Penguins popularity has at times even rivaled that of the Steelers at the local level. Considered by some to be the best rivalry in the NHL, the Philadelphia Flyers–Pittsburgh Penguins rivalry began in 1967 when the teams were introduced into the NHL's "Next Six" expansion wave. The rivalry exists both due to divisional alignment and geographic location, as both teams play in Pennsylvania. The Flyers lead the head-to-head record with a 153–98-30 record. However, the Penguins eliminated the Flyers from the playoffs in 2008 and 2009 and were eliminated from the playoffs in 2012 by the Flyers, strengthening the rivalry. In total, the franchises have met seven times in the playoffs, with the Flyers winning four series (1989 Patrick Division Finals, 4–3; 1997 Eastern Conference Quarter-finals, 4–1; 2000 Eastern Conference Semi-finals, 4–2; and 2012 Eastern Conference Quarter-finals, 4–2) and the Penguins winning three (2008 Eastern Conference Finals, 4–1; 2009 Eastern Conference Quarterfinals, 4–2; and 2018 Eastern Conference First Round, 4–2). An altercation between the Penguins and the Washington Capitals during the 2009 playoffs. The Penguins and Capitals have faced one another in ten playoff series. The two teams have faced-off eleven times in the playoffs, with the Penguins winning nine of the eleven matchups, their two series losses coming in the 1994 and 2018 playoffs. The Penguins defeated the Capitals en route to all five of their Stanley Cup victories. They have met in a decisive game 7 in the 1992, 1995, 2009 and 2017 playoffs. This rivalry was showcased at the NHL's fourth Winter Classic, played on January 1, 2011, at Heinz Field in Pittsburgh. The Capitals won the game 3–1. The rivalry can also be seen in the American Hockey League (AHL). Pittsburgh's top farm team is the Wilkes-Barre/Scranton Penguins, and their in-state and biggest rivals are the Capitals' top farm team, the Hershey Bears. When the Penguins made their NHL debut in 1967, the team wore the colors dark blue, light blue and white. The uniforms had the word "Pittsburgh" written diagonally down the front of the sweater with three dark blue stripes around the sleeves and bottom. The logo featured a hockey-playing penguin in a scarf over an inverted triangle, symbolizing the Golden Triangle of downtown Pittsburgh. A refined version of the logo appeared on a redesigned uniform in the second season, which removed the scarf and gave the penguin a sleeker, "meaner" look. The circle encompassing the logo was removed mid-season in 1971–72. The team's colors were originally powder blue, navy blue, and white. The powder blue was changed to royal blue in 1973, but returned in 1977 when navy became the predominant uniform color. The team adopted the current black and gold color scheme in January 1980 (the announcement was made at halftime of Super Bowl XIV) to unify the colors of the city's professional sports teams, although like the Pittsburgh Pirates and Steelers, the shade of gold more closely resembled yellow. The change was not without controversy, as the Boston Bruins protested by claiming to own the rights to the black and gold colors. However the Penguins cited the colors worn by the now-defunct NHL team Pittsburgh Pirates in the 1920s, as well as black and gold being the official colors of the City of Pittsburgh and its namesake, thus were able to secure permission to use the black and gold colors. The NHL's Pittsburgh Pirates used old Pittsburgh Police uniforms, hence beginning the black and gold sports tradition in the city. This would remain unchanged until the 1992–93 season, when the team unveiled new uniforms and a new logo, made by Pittsburgh visual communications agency Vance Wright Adams. The logo featured a modern-looking, streamlined penguin. Although the "Robo-Penguin" logo survived in various forms for 15 years, it received mixed responses from fans and was never as widely accepted as the "skating penguin" logo. Longtime KDKA anchor Bill Burns even went as far as calling the penguin in the logo "a pigeon." 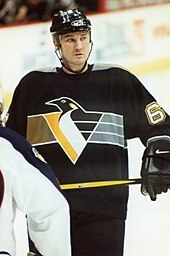 After Mario Lemieux (a personal fan of the "skating penguin" logo) purchased the team from bankruptcy court in 1999, he announced plans to bring back the "skating penguin" logo. This occurred for the 2000–01 season, when the team revived the logo (albeit with a "Vegas gold" triangle instead of "Pittsburgh gold") on the chest of the team's new alternate jersey. In 2002–03, the logo became the primary logo, and the "flying penguin" logo (also with a "Vegas gold" triangle instead of "Pittsburgh gold") was relegated to secondary status and only on the shoulders of the team's jerseys, until it was retired in 2007 when the team introduced their version of the Rbk Edge uniforms. Player names were first added in 1970. Until 1977, the team had some minor striping patterns on the jerseys change every few years. But in 1977, the team basically adopted their longest-lasting uniform style to date and a style they would wear for the next 16 seasons, winning the Stanley Cup twice in the process. When the colors were swapped from blue and white to black and gold in 1980, the uniform patterns themselves remained unchanged. This was likely due to the fact that the change was made in the middle of the season. From the 1981–82 season to the 1984–85 season, the team had a gold "Sunday" jersey, called as such because the team only wore them on Sundays. This was a rare example of an NHL team having a third jersey before the rule allowing such jerseys was officially implemented in 1995. After winning their second Stanley Cup title in 1992, the team completely redesigned their uniforms and introduced the "flying penguin" logo. The team's away uniforms were somewhat of a throwback to the team's first season, as they revived the diagonal "Pittsburgh" script. In 1995, the team introduced their second alternate jersey, featuring different stripe designs on each sleeve. This jersey would prove to be so popular that the team adopted it as their away jersey in 1997. In 2000, the team unveiled yet another alternate jersey, the aforementioned black jersey featuring the revival of the "skating penguin" logo. This would later prove to be a test to see how the revived logo would do with fans, and the following season became the team's away uniform with a white version as the team's home jersey. This time, the gold used is known as "Vegas gold", a more metallic shade. When the Rbk Edge jerseys were unveiled for the 2007–08 season leaguewide, the Penguins made major striping pattern changes and quietly removed the "flying penguin" logo from the shoulders. They also added a "Pittsburgh 250" gold circular patch to the shoulders to commemorate the 250th birthday of the city of Pittsburgh. Throughout the 2016–17 season, a commemorative patch was added to the uniforms to celebrate the team's 50th anniversary. While the Penguins, as with the rest of the NHL, have worn their black jersey at home since the league made the initiative to do so starting with the 2003–04 NHL season, the team wore their white jerseys in some home games during the 2007–08 season and at least once during the 2008–09 season, as well as wearing their powder blue, 1968–1972 "throwbacks" against the Buffalo Sabres in the 2008 NHL Winter Classic. On November 5, 2008, this jersey was introduced as the team's new alternate jersey. This was worn for select home games during the 2008–09, 2009–10 and 2010–11 seasons. This throwback was supposedly retired with the introduction of a new dark blue third jersey that made its debut at the 2011 NHL Winter Classic at Heinz Field, but it was worn at several games after the 2011 Winter Classic. The new 2011 Winter Classic jersey was first worn as the third jersey against the Los Angeles Kings on February 10, 2011. After this, the Penguins discontinued the usage of their 2008 Winter Classic jerseys. For the 2011–12 season, the 2011 Winter Classic jersey was the team's official third uniform, with the 2008 Winter Classic uniform being retired. Called the "Blue Jerseys of Doom" by the Pittsburgh Tribune-Review, the alternate jerseys were worn when Sidney Crosby sustained a broken jaw injury on March 30, 2013, and also when he received a concussion in the 2011 Winter Classic. Center Evgeni Malkin was also injured, also with a concussion, during a game when the Penguins donned the alternate uniforms on February 22, 2013. The team was set to wear the blue jerseys for an April 2, 2013, game against the Buffalo Sabres, three days after Crosby sustained a broken jaw wearing one, but instead wore their black and "Vegas gold" home jerseys. On September 19, 2014, the Penguins released their new alternate uniforms for the 2014–15 season. The new black uniforms are throwbacks to the early part of Lemieux's playing career, emulating the uniforms worn by the Penguins' 1991 and 1992 Stanley Cup-winning teams. The new alternate uniform featured "Pittsburgh gold", the particular shade of gold which had been retired when the Penguins switched to the metallic gold full-time in 2002. After the 2016 season, the team returned to using the "Pittsburgh gold" jerseys as the primary uniforms. The "Vegas gold" jerseys were retired, in time for the 50th anniversary in 2017. The new home and away "Pittsburgh gold" jerseys were unveiled on June 24, 2016, and first presented at the 2016 NHL Entry Draft. A commemorative patch was added to the uniforms throughout the 2016–17 season to celebrate the team's 50th year of play in the NHL. The Penguins currently have their radio home on WXDX-FM and their television home on AT&T SportsNet Pittsburgh. The Pittsburgh Penguins Radio Network consists of a total of 34 stations in four states. Twenty three of these are in Pennsylvania, four in West Virginia, three in Ohio, and three in Maryland. The network also features an FM High-Definition station in Pittsburgh. The Penguins were broadcast by local ABC affiliate WTAE-TV during the 1967–68 season, with station Sports Director Ed Conway handling the play-by-play during both the television and radio broadcasts and would remain as the lone play-by-play broadcaster until the completion of the 1968–69 season. Joe Tucker took over for Ed Conway during the 1969–70 season, when WPGH-TV and WTAE-TV split Penguins' broadcasts. WPGH-TV retained the rights to broadcast the Penguins for the 1970–71 season with Bill Hamilton handing the play-by-play duties. The 1970–71 season was also the first season where the Penguins introduced a color commentator to the broadcast team, with John MacDonald taking the position as the booth's color commentator. The broadcasting rights to the Penguins were then transferred to WIIC-TV 11 in 1971, with Sam Nover handling the play-by-play with several color commentators interchanged during his tenure. Nover eventually left WIIC to join NBC Sports as a play-by-play broadcaster for the National Football League. During the Penguins' time with WIIC, the station broadcast "about a dozen" Penguins game each season. Penguins' games returned to WPGH-TV for the 1977–78 season with former long-time Pittsburgh Pirates broadcaster Bob Prince handling the play-by-play. Prince was criticized by fans for not being knowledgeable towards the game and that his style was better suited for baseball than hockey. He was later removed from the broadcast team and reassigned as an intermission interviewer. In his place was Jim Forney, who had previously held the position of color commentator during Sam Novak's tenure. Mike Lange is the Penguins' current play-by-play radio announcer. Lange has been the Penguins' announcer since 1974. Mike Lange, who joined the Penguins' broadcast team as a play-by-play announcer on the radio side in 1974–75, became the play-by-play broadcaster for the team at the start of the 1979–80 season. At his side was Terry Schiffauer, who had previously held the position of Penguins' director of public relations and eventually transitioned into color commentator for Sam Nover since 1972–73. Lange and Schiffauer remained a team in the Penguins' broadcast booth until 1984–85, when Schiffauer was replaced by Paul Steigerwald. While the Penguins broadcast network transitioned from WPGH-TV (1979–90) to KDKA-TV (1990–96), along with the eventual transition to KBL (later Prime Sports) and eventually Fox Sports Pittsburgh 1996–2011), the team of Lange and Steigerwald remained a constant in the broadcast booth from 1985 until 1999. During this time, local stations WPGH and WPTT-TV also carried a handful of games that were not available on Fox Sports Pittsburgh during the 1996–97 season. Also notable during the 1996–97 NHL season is that former broadcaster Sam Nover returned to the team in a new role; this time as a post-game studio host, sharing duties with John Fedko and Thor Tolo. With Steigerwald's departure in 1999, Mike Lange shared the broadcast booth with former Penguins' defenseman Peter Taglianetti. Taglianetti, a two-time Stanley Cup winner with the team in 1991 and 1992, remained in the position for one season before being replaced by Ed Olczyk. Lange and Olczyk were broadcast partners from 2000 until 2003, when Olczyk left the booth to become the 18th head coach in Penguins history that had become upon due to the firing of previous Head Coach Rick Kehoe after the 2002–03 season. With Olczyk's vacancy, the Penguins hired Bob Errey as their new color commentator for the start of the 2003–04 season (a position that he continues to hold as of the start of the 2012–13 season. Lange and Errey remained in the booth until 2005–06. After 26 seasons in the television broadcast booth, Mike Lange was not retained by FSN Pittsburgh. Instead, he was replaced by former broadcast partner Paul Steigerwald, who remained the TV play-by-play broadcaster for the team until the 2016–17 season. Lange returned to the radio broadcast booth and currently holds the position of radio play-by-play announcer, the same position he had held with the team in the mid-1970s. Following the 2016–17 season, Steigerwald moved back to the Penguins front office and NHL Network personality Steve Mears was hired as the new television play-by-play announcer starting with the 2017–18 season. Every Penguins game is currently carried on the AT&T SportsNet Pittsburgh network, which is carried by cable providers in most of two states and parts of four others: All of Pennsylvania (save the ten county Philadelphia metro area), all of West Virginia except the two counties in the Washington, D.C., metro area, eight counties in eastern and southern Ohio, three counties in Western Maryland, one county in Southwestern New York state and one county in Northeastern Kentucky. In addition, Fox Sports Ohio simulcasts Penguins hockey in the Cleveland metro area, as well as some parts of Eastern Ohio and Northern Kentucky. Dish Network, Verizon FiOS and Direct TV all carry the Penguins games on their AT&T SportsNet Pittsburgh channel in HD nationally. The Pittsburgh Penguins also receive monthly and sometimes weekly "game of the week" national exposure on both NBC Sports Network and NBC along with TSN and CBC Sports in Canada. Prior to 2004, Penguins games have been aired on ESPN and ESPN2. The Penguins called Civic Arena home for over 45 seasons, beginning with their inception in 1967. In September 2010, they completed the move to the state-of-the-art Consol Energy Center (now named PPG Paints Arena). The Penguins also played two "home" games in the Cleveland suburb of Richfield, Ohio, in 1992 and 1993 at the Richfield Coliseum (this is not unlike the Cleveland Cavaliers of the NBA playing an annual pre-season game in Pittsburgh; the Philadelphia 76ers also used the Civic Arena as a second home in the early 1970s). The UPMC Lemieux Sports Complex under construction in Cranberry Township, Pennsylvania in April 2015. The complex opened in August 2015, and is used by the Penguins as their practice facility. From 1995 to 2015 the IceoPlex at Southpointe in the South Hills suburbs served as the team's practice facility. Robert Morris University's 84 Lumber Arena has at times served as a secondary practice facility for the team. During the franchise's first pre-season training camp and pre-season exhibition games, the Brantford Civic Centre in Brantford, Ontario, served as its home, and by the 1970s and continuing through the 1980s, the team was using the suburban Rostraver Ice Garden for training. In August 2015, the Penguins and the UPMC opened UPMC Lemieux Sports Complex, combining a new team practice and training facility with a UPMC Sports Medicine treatment and research complex, in suburban Cranberry Township near the interchange between Interstate 79 and Pennsylvania Route 228. The twin rink facility replaced both the IceoPlex at Southpointe and the 84 Lumber Arena as the Penguins' regular practice facility, freeing up the Consol Energy Center for other events on days the Penguins are not scheduled to play. As with most other NHL arenas, the Penguins make use of a goal horn whenever the team scores a goal at home. It is also played just before the beginning of a home game, and after a Penguins victory. Their current goal horn, made by Nathan Manufacturing, Inc. and introduced in 2005 to coincide with the arrival of Sidney Crosby to the team, was used at both the Civic Arena and the Consol Energy Center. The Penguins have two minor league affiliates assigned to their team. The Wilkes-Barre/Scranton Penguins, their AHL affiliate, have played in Wilkes-Barre Township, Pennsylvania, since 1999. The Penguins also have a secondary affiliate in the ECHL, the Wheeling Nailers, which they have been associated with since the start of the 2000–01 season. Sidney Crosby with Marc-Andre Fleury (left) and the Stanley Cup during the Penguins' victory parade in 2009. This is a partial list of the last five seasons completed by the Penguins. The banners of numbers retired by the Penguins franchise hang in the rafters of the PPG Paints Arena. A Taken out of circulation following Briere's death (1971), but not officially retired until January 5, 2001. B Lemieux's number was restored when he resumed playing for the team on December 27, 2000, and once again retired on October 5, 2006. Though not retired, no. 68 has not been issued since Jaromir Jagr was traded in 2001 and Lemieux himself confirmed that the number would be retired in the future. The Pittsburgh Penguins presently acknowledge an affiliation with a number of inductees to the Hockey Hall of Fame. Inductees affiliated with the Penguins include 11 former players and four builders of the sport. The four individuals recognized as builders by the Hockey Hall of Fame includes former head coaches, and general managers. In addition to builders and players, broadcasters and sports journalists have also been recognized by the Hockey Hall of Fame. In 2001, radio play-by-play broadcaster Mike Lange, was awarded the Foster Hewitt Memorial Award from the Hall of Fame. In 2009, Dave Molinari, a sports journalist for the Pittsburgh Post-Gazette was awarded the Elmer Ferguson Memorial Award from the Hall of Fame. The team's current captain, Sidney Crosby, during a playoff game in 2016. Kris Letang holds the franchise's all-time points record for a defensemen. These are the top-ten goaltenders in franchise history by wins. Figures are updated after each completed NHL regular season. The Pittsburgh Penguins Foundation conducts numerous community activities to support both youth and families through hockey education and charity assistance. ^ Red Kelly was the Penguins' head coach from 1969–73. He was inducted in the Hockey Hall of Fame in the players' category in 1969. Although Kelly never played with the Penguins, and was not formally inducted in the builders category, the team continues to acknowledge an affiliation with the Hall of Famer. ^ "Penguins Make The Move to 'Pittsburgh Gold'". PittsburghPenguins.com. NHL Enterprises, L.P. June 24, 2016. Retrieved April 18, 2017. ^ "Penguins Uniform History". PittsburghPenguins.com. NHL Enterprises, L.P. Retrieved May 8, 2018. ^ a b "Steel City Legend: Sen. Jack McGregor". Pittsburgh Hockey.net. ^ a b Stainkamp, Michael (August 25, 2010). "A brief history: Pittsburgh Penguins". National Hockey League. Retrieved April 23, 2016. ^ "Why the name Pittsburgh Penguins?". LetsGoPens.com. September 19, 2002. Retrieved April 23, 2016. ^ "Uniform History". Pittsburgh Penguins. Archived from the original on April 28, 2016. Retrieved April 23, 2016. ^ "Penguins Start Training Sessions". Pittsburgh Post-Gazette. September 14, 1967. ^ "Penguins like feel of home". The Leader-Post. January 23, 1975 – via Google News Archive Search. ^ "Pittsburgh penguins debut vs St Louis". January 30, 1980. ^ "Pittsburgh Hockey History". PenguinsJersey.com. ^ "It Was a Great Night For Hockey – in Kansas City". National Hockey League. ^ "Judge grants Ottawa Senators bankruptcy protection". ^ a b Burnside, Scott (July 22, 2005). "Penguins, league hit jackpot with lottery". ESPN.com. Retrieved April 9, 2019. ^ "NHL Draft Lottery History". TSN.ca. April 8, 2019. Retrieved April 9, 2019. ^ "NHL Entry and Amateur Draft History". Hockey-Reference.com. Retrieved April 9, 2019. ^ "Lemieux announces retirement". ESPN. 2006-01-25. ^ Allen, Kevin (2006-01-25). "Lemieux says goodbye for final time". USA Today. ^ "Game Summary". National Hockey League. 2007-02-19. ^ Allen, Kevin (2009-06-13). "Penguins ride Talbot to 2–1 Game 7 win over Red Wings". USA Today. Retrieved 2009-07-02. ^ Aaron Beard (2010-10-14). "Penguins beat Hurricanes 3–2 in shootout". Yahoo! Sports. Retrieved 2010-12-29. ^ Gelston, Dan (April 23, 2012). 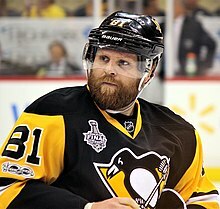 "Penguins humbled, disappointed after being ushered from playoffs by rival Flyers". National Hockey League. Retrieved 2012-06-23. ^ Masisak, Corey (June 22, 2012). "Penguins deal Jordan Staal to 'Canes". National Hockey League. Retrieved 2012-06-23. ^ "Penguins trade Michalek back to Phoenix for Ruopp, pick". TSN. June 23, 2012. Archived from the original on 2012-06-26. Retrieved 2012-06-23. ^ "Penguins fire Ray Shero, new GM to decide Dan Bylsma's fate". CBS Sports. 2014-05-16. Retrieved 2014-05-16. ^ "Canucks acquire Sutter & 3rd rounder from Pens". Vancouver Canucks. Retrieved July 28, 2015. ^ "Penguins sign Matt Cullen to 1-year deal". Pittsburgh Penguins. 2015-08-06. Retrieved 2015-08-06. ^ "Mike Sullivan Named Head Coach of Pittsburgh Penguins". 2015-12-12. Retrieved 2016-06-13. ^ "Penguins notebook: Scuderi traded to Blackhawks for Daley". Pittsburgh Tribune-Review. 2015-12-14. Retrieved 2015-12-15. ^ "Penguins acquire forward Carl Hagelin from the Ducks". Pittsburgh Penguins. 2016-01-16. Retrieved 2016-01-16. ^ "Oilers deal Justin Schultz to Penguins for a pick". Yahoo! Sports. 2016-02-27. Retrieved 2016-02-28. ^ West, Bill (2016-06-13). "Penguins' rookies relish title run together". Pittsburgh Tribune-Review. Retrieved 2016-06-14. ^ "Penguins top Lightning 2–1 to advance to Stanley Cup final". Associated Press. 2016-05-26. ^ West, Bill (2016-06-13). "Penguins' Crosby tabbed as Conn Smythe winner". Pittsburgh Tribune-Review. Retrieved 2016-06-14. ^ Mackey, Jason (October 14, 2016). "Arena, fans aglow as Penguins raise Cup banner". Pittsburgh Post-Gazette. Retrieved January 2, 2017. ^ Heyl, Eric (2017-05-16). "Paul Steigerwald Out, Steve Mears In On Penguins Broadcast Team". Patch. ^ Steigerwald, John (2010). Just Watch the Game. Renaissance News, Inc. p. 117. ^ Collier, Gene (2008-05-25). "This is Hockeytown?". Pittsburgh Post-Gazette. Retrieved 2008-06-07. ^ Anderson, Shelly (2007-11-07). "Penguins Notebook: In this case, No. 20 ranking is huge". Pittsburgh Post-Gazette. Retrieved 2008-06-07. ^ "Pittsburgh Sports Report – Can the Penguins challenge the Steelers for popularity in Pittsburgh? By John A. Phillips". pittsburghsportsreport.com. ^ "Flyers-Penguins Is The NHL's Best Rivalry". Deadspin. Retrieved March 10, 2017. ^ ""I think this is currently the biggest rivalry in the NHL." – Four former NHL players talk Penguins vs. Flyers". Retrieved March 10, 2017. ^ "Ranking the NHL's 10 Best Rivalries". Sports Illustrated. Retrieved March 11, 2017. ^ "Philadelphia Flyers Head-to-Head Results". Hockey-Reference. Sports Reference LLC. ^  Three years later, the Flyers won the sixth playoff meeting between the clubs to advance to the Conference Semi-finals. Moldovanyi, Rick (December 20, 2009). "Pittsburgh Penguins vs. Philadelphia Flyers: The Best Rivalry in the NHL Today?". The Hockey Writers. Retrieved 2010-01-03. ^ a b c d e f "Penguins Uniform History". National Hockey League. August 13, 2018. ^ Stark, Logan (3 May 2018). "Hockey History: The Pirates - Pittsburgh's First NHL Team". PensBurgh. Retrieved 26 January 2019. ^ a b "Integrated Marketing Agency – Pipitone Group". vwadesign.com. Archived from the original on 2013-11-10. Retrieved 2018-12-05. ^ "Skating penguin logo returns to center ice". Pittsburgh Post-Gazette. August 22, 2002. Retrieved June 18, 2016. ^ Anderson, Shelly (May 29, 2010). "Heinz 'in' place to be Jan. 1". Pittsburgh Post-Gazette. ^ Molinari, Dave (September 13, 2011). "Penguins to use Winter Classic sweaters". Pittsburgh Post-Gazette. ^ Rossi, Rob (April 4, 2013). "Penguins notebook: Crosby visits team, still no set return date". Pittsburgh Tribune-Review. ^ "Penguins to wear 'Pittsburgh gold' jerseys during playoff home games". Pittsburgh Post-Gazette. April 11, 2016. Retrieved January 23, 2017. ^ Muir, Allan (June 24, 2016). "Pittsburgh Penguins reveal new jerseys for 50th season". Sports Illustrated. Retrieved January 23, 2017. ^ "Media Affiliates – Schedule". Pittsburgh Penguins. Retrieved 2010-12-29. ^ a b "Hard Time For Hockey Fans". pbrtv.com. April 28, 2012. Retrieved October 2, 2012. ^ Jordan Palmer (April 15, 2003). "Penguins Fire Coach Rick Kehoe". kdsk.com. Retrieved October 2, 2012. ^ "Scenes from Pittsburgh". Cleveland Cavaliers. ^ "NBA.com: Regular Season Records: Field Goals". National Basketball Association. ^ "Pittsburgh Penguins Start With Many Goalies on Team". Observer-Reporter. September 13, 1967. p. 4, Section D.
^ Crechiolo, Michelle (August 14, 2015). "UPMC Lemieux Sports Complex Has Grand Opening". The Pittsburgh Penguins. National Hockey League. Retrieved August 16, 2015. ^ "New site in Cranberry chosen for UPMC-Penguins joint development – Pittsburgh Post-Gazette". Pittsburgh Post-Gazette. ^ "All about NHL goal horns". Frozen Face Off. Retrieved October 5, 2018. ^ "NHL Videos and Highlights". National Hockey League. ^ "Penguins, Nailers renew affiliation agreement – Pittsburgh Sporting News". 22 July 2015. ^ "Pittsburgh Penguins Roster". NHL.com. Retrieved October 11, 2017. ^ "Pittsburgh Penguins Hockey Transactions". TSN.ca. Retrieved October 3, 2017. ^ Kovacevic, Dejan (January 6, 2001). "Penguins Report: 01/06/01". Pittsburgh Post-Gazette. Retrieved March 3, 2013. ^ Robinson, Alan (November 20, 1997). "Lemieux Teary as His Jersey Retired". Pittsburgh Post-Gazette. Retrieved March 3, 2013. ^ Deardo, Bryan (January 27, 2017). "Mario Lemieux: Jaromir Jagr's jersey will be retired". Pittsburgh Steelers. Retrieved April 8, 2019. ^ a b c d "Honors/Awards" (PDF). 2016.17 Pittsburgh Penguins Media Guide. Pittsburgh Penguins. 2016. p. 291. Retrieved April 28, 2018. ^ "Foster Hewitt Memorial Award winners". Hockey Hall of Fame and Museum. 2018. Retrieved April 28, 2018. ^ "Elmer Ferguson Memorial Award Winners". Hockey Hall of Fame and Museum. 2018. Retrieved April 28, 2018. ^ "Ron Francis". Legends of Hockey. Archived from the original on 2007-11-12. Retrieved 2008-02-04. ^ "Regular Season – All Skaters – Career for Franchise – Career Points – National Hockey League.com – Stats". National Hockey League. Retrieved May 4, 2013. ^ "Regular Season – Goalie – Goalie Career for Franchise – Career Wins – NHL.com – Stats". National Hockey League. Retrieved May 4, 2013. Buker, Rick (2010). Total Penguins: the definitive encyclopedia of the Pittsburgh Penguins. Chicago, Ill: Triumph Books. ISBN 9781600783975. Wikimedia Commons has media related to Pittsburgh Penguins. This page was last edited on 21 April 2019, at 21:00 (UTC).